How far would global transformer industry trends be influenced by the escalating furor of urbanization and renewable energy integration? The current urbanization mania and the soaring population have undeniably led to an upsurge in power demand, thereby driving global transformer industry. Indeed, the market is estimated to witness an annual installation of 6 million units of transformers by 2024. Statistics indicate that when compared to the consumption about three decades back, electricity consumption has increased to 21.15 trillion kilowatt hours in 2015. The invention of numerous new electronic gadgets and the dependency on electricity to run various components that used other energy resources in the past have contributed to this increase in electricity consumption. Needless to say, electricity has become one of the basic necessities of life while the availability of electricity has become a benchmark for the measurement of life quality. With the increased distribution of electricity, global transformer industry has inevitably expanded and is anticipated to garner increasing profits over the forthcoming years. The efforts by numerous geographies to rapidly increase global power consumption has certainly been a major impetus of sorts for the growth of global transformer market. Incidentally, power consumption in China rose was more than 5,500 terawatt hours in 2016, a trend that has been credited to the large population of the country. The United States is a close second – the nation recorded a consumption of more than 4,000 terawatt hours in 2015. However, consumption of power also depends on several factors such as appliances penetration, market saturation, and heating and cooling. Possibly, these factors led to Canada consuming a sizeable 545-terawatt hours of electricity in spite of having a population of about 36 million. Notably, an increase in power generation rate occurred in Asia in 2017 with China developing its power generation capacities to meet the increased consumption rate. India and Japan followed China as both these nations have registered immense demand for electricity via widespread urbanization. These growth trends across myriad nations have intrinsically augmented the global transformer industry as transformers are an integral part of electricity distribution. The rise in world population has quite overtly emerged as one of the leading reasons for increase in electricity demand and consequently, has been responsible for propelling the global transformer market growth. According to a study published by UN Department of Economic and Social Affairs, world population in 2017 was estimated to be 7.6 billion and is expected to reach 8.6 billion in 2030, increasing further to 9.8 billion by 2050. Even assuming that fertility levels will decline, a trend that is evident in many countries around the world, an estimated 83 million people would be added to the global population every year, continuing the upward trend for population rise in the future. With increasing population, energy consumption is also, quite blatantly, expected to rise. It is a matter of ironic significance to note that China and India, the countries included among the list of the most populous nations across the globe, also happen to be the ones that have been generating the most power and attempting to increase power generation capacity as well. In 2016, the increase of electricity consumption in China, due to industrial recovery and strong energy efficiency enhancements, accounted for more than half of the world electricity consumption rebound. Population rise will naturally increase electricity consumption and more transformers will have to be deployed to facilitate power distribution, inherently pushing transformer industry trends. It has been observed that quite some proportion of the growing global population has been migrating to cities, providing an impetus to the rising urbanization trends. According to statistics collated by the World Health Organization, in 2014, 54% of the total global population resided in urban regions. It is estimated that eventually a major percentage of the populace will be living in urban areas leading the global urban population to grow approximately by 1.63% per year between 2020 and 2025 and 1.44% per year between 2025 and 2030. One of the reasons that a significant section of the population will prefer to live in urban regions is the availability of electricity in such regions. Countries like India and China, where population is expanding exponentially are also working towards developing their urban zones. As urbanization becomes more widespread, it will create a greater demand and growth scope for the global transformer market. According to data presented by United Nations in 2014, 82% of the population of North America lived in urban areas followed by 80% of population of Latin America and the Caribbean and 73% population of Europe. These regions which have already been urbanized are also creating a growth avenue for the global transformer market as the cities are striving to upgrade their aging electricity grids with newer technology. This is being done to integrate more energy saving technologies that are meant to bring down global levels of emission and for assimilating renewable energy resources into the mix. The revolutionary trend of amalgamating renewables to fulfill global power demands is certain to have an impact on the global transformer industry outlook. For instance, Germany has launched a major initiative to shift from a fossil fueled country to a nuclear powered one and is therefore looking to enhance its infrastructure to support a different kind of energy system. Germany is geared up to generate a commendable amount of renewable power and therefore the country’s grid should be equipped to properly use the generated power. The government of the country is trying to develop cross-country power connections that can be used to meet the raised renewables target for 2030. The global transformer market will receive a major boost from such developments that are becoming evident in most countries as new enhancements in the grid system can save consumers millions in terms of capital. The upgrading of grids is on the agenda of developed countries with an already established electricity distribution system, a trend that will contribute to the growth of the global transformer industry. The European Commission, in an effort to make Europe’s electricity grid fit for its energy conservation and emission control targets of 2020, has decided that achieving a 10% electricity interconnection target is inevitable. EU policymakers are moving to upgrade and build-out both electricity and gas grids as an indispensable investment for energy security and sustainability as electrical grid expansion will allow more renewables to be absorbed by the system. With a vast spate of regulatory measures that are being enforced across most of the global geographies, it is rather overt that the power requirement demand for the future is well addressed. 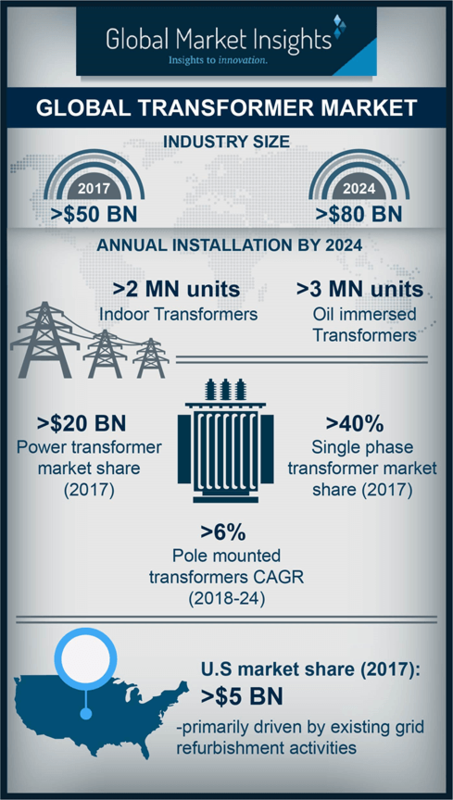 As more and more initiatives come into play in order to lower emission levels, increase energy efficiency, and optimize energy consumption in the face of changing climatic conditions and excessive electricity demand, it is an undeniable fact that global transformer market will be the recipient of increased investments and gain considerable traction over 2018-2024.